Cutter gloves are made of thick, grey, goatskin leather. They feel nice and are soft but tough. I personally have never had gloves that felt this good and that also give protection without fatiguing the fingers. What's more, Cutter Gloves are also robust. They have an extended cuff for wrist protection and the padded palm is an excellent solution to providing extra armour. Kevlar stitching gives the gloves real strength. These gloves should last for a long time.They are made by hand in China, but we are assured that they are "ethically made". 'Mr W loves these gloves and uses them all the time and has recommended to lots of chaps. I just think goats are amazing animals and I drink goats milk and we love their cheese'.
.'It was flipping cold, so they kept my hands nice and warm. Left hand Chainsaw glove suitably sturdy, right hand and trigger finger was on the money. Definitely felt the business and I have a fair degree of experience with Chainsaw gloves'. After a request to trial the cutter work gloves I was sceptical about them as they are advertised as gloves that are designed by tree surgeons, for people like me (I have heard that before!). I am a working tee surgeon and I am one that likes to wear gloves, I wear them when climbing and when doing ground work, when hedge trimming and when maintaining the saw. I will normally get throw gloves fast as moving rope, sharp tools and abrasive materials take their toll fast. I estimate that I spend about £7-10 a month on gloves. I would typically have two pairs of gloves one for climbing that are tighter and thinner for better dexterity and a thick pair for everything that can be done with clumsy pincers. When I received my gloves I liked the simple packaging design. It simply tells you what the gloves are for, there material there made from, and there size. The gloves are made off goatskin leather and are very soft to the touch, because of this softness I didn’t have high hopes for their strength but I was very wrong, I have been using these gloves most off summer now probably working an average of 3 days a week in them, I received them mid June and its now early November (4.5 months) and the're still going strong there are no major holes or rips yet, and the stitching (normally first to go) is still pretty good the only place it has started to brake is on the palm and I would think this is because of how I move the chain when shaping. But because of the reinforced palm and double Kevlar stitching the gloves are still usable and going strong. The gloves come in a snug fit witch I like. I found them to have good puncture resistance from thorns I use them when cutting blackthorn, rose and brambles with very little coming throw. They also have good abrasion resistance from ropes and files (when sharpening) and I am able to climb in them and manipulate karabiners and tie/untie knots. But this is not ideal as there is still times when the glove will get snagged up. The only major problem I found from these gloves is there performance in the wet. The leather gets very slippery, this is not a problem for ground work but holding equipment and ropes becomes very hard and I found myself removing them. Overall I think these gloves are very strong well built and well thought out. They have lasted me longer than my previous gloves and are cheaper costing only £7.99 from their web site. I would happily buy these gloves for work but would still have my tight climbing gloves as back up. I have marked them down slightly as they become slippery when wet, so I give these gloves an 8/10-very good. B.T, Tree Surgeon, West Sussex. DB, Head Gardner, Brodsworth Hall & Gardens. 'I absolutely loved them on the ground really comfy, suprisingly breathable, nice and thick, and in the tree they are great for using the chainsaw and general climbing when no lowering was needed. they seem to still be in good condition. I ordered M in the Cutter and i am a pleased that these gloves are a perfect fit. The leather is very soft and you can move fingers very well to maintain accurate dexterity. do they make different sizes ? Like i said, i found the fingers a little baggy but that may just be the size of my fingers. They are very hard wearing (using them whilst coppicing with large thorns !!) and very protective. The extra brushed leather palm protection is excellent. Overall, very good. Very good gloves, good value, well made. You could charge more. I have been unable to wear them out yet but getting some in stock in case you stop doing them. 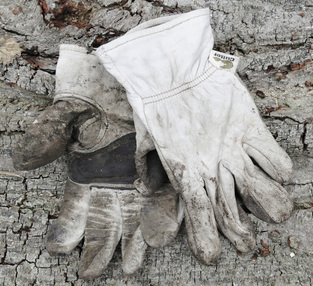 The gloves are excellent & incredible value, the best work gloves I have found. I would recommend them to anyone. The first were a little large but I use them with thermal liners. The second ones I ordered, medium, are perfect. The nearest I have come to gloves of this quality and comfort cost over £25. Best wishes with future sales.